There are literally dozens of ways to “distort” your sound in MainStage, including phase, downshifting, tube, foldback, rotary, overdrive, amp simulation, phase, spectrum shift, crossover, mechanical, XCite, and a few others. Fortunately they all work on the same basic principle: introducing distortion into the signal path. I’ll be focusing on the simplest distortion plugin in MainStage today, creatively titled “Distortion” in your plugin list (the guys at Apple got crazy with naming this one, for sure). Drive: This knob controls how much distortion you add to your signal. Tone: This knob controls whether the distortion is raspy or boomy. Output: This controls how loud your final signal is. 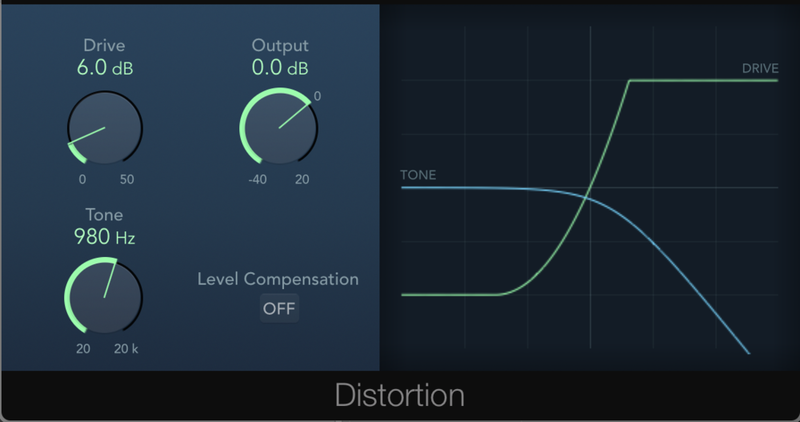 Almost all distortion plugins will have these three options. If you master how to mess with each parameter you’ll be able to carry the principles across to the other plugins. Next week I’ll be starting up a series on answering some of your questions about MainStage. You can send me an email via this website with your question, and I might just answer it in a future blog! (Note: if your question involves specific hardware your odds go down that I’ll answer it in a blog).